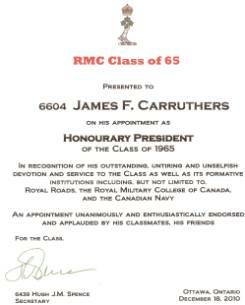 In the year of its 45th anniversary of graduation from RMC and its entry to the Old Brigade, the RMC Class of 1965 has unanimously affirmed the appointment of 6604 James F. “Fats” Carruthers, Ph.D., P.Eng., CAPT (N) (Ret’d) to the position of Honourary President of the Class. Since 1965, the Class has never had any “officer” at all other than a Secretary elected in 1970. The special presidential appointment is in recognition of Jim’s longstanding and generous service to the Class as well as to the formative institutions for some or all of its members such as Royal Roads, the Canadian Navy, and in particular the Royal Military College of Canada. One has only to note his personal involvement in the very successful fund-raising for the RMC Class of 65 Teaching Excellence Award, and the Class’s newly established Professorship in Leadership, a total endowment of over $1.6 million dollars. He also has his “own” military college scholarship program for RETP students across Canada (17 scholarships were awarded last year) and has been a stalwart in all things naval. His encouragement of regular luncheons for the sizable Ottawa “rump” of the Class has kept a great focal centre going so that even classmates from across Canada and overseas have felt there’s a “place to go” in Ottawa, at least monthly. 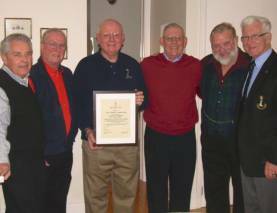 Since graduation, the Class of 65 has had only one elected officer, Secretary 6439 Hugh Spence. He was acclaimed at a Class meeting at its first reunion in 1970, mainly because he was the only Class member living in Kingston. 6604 James Franklin Carruthers, Ph.D., P.Eng. A native of Drumheller, AB, Jim attended Royal Roads, received his undergraduate degree in Electrical Engineering from RMC in 1965 and his Ph.D. in EE in 1974 from Dalhousie (Tech). He was a member of the Canadian Armed Forces Command and Staff College class of 1977. Jim served as a general list officer and was the prototype for the Combat Systems Engineer (CSE) military occupation. After leaving the Navy in 1982 Capt(N) Carruthers was CEO of Norpak Corporation until he retired in 2006. Post retirement Jim has become involved with several non-profit/charitable organizations and serves on the Boards of the RMC Foundation, the Conference of Defence Associations Institute, the Naval Officers Association Of Canada Ottawa Branch, the Canadian Naval Technical History Association, the HMCS Bytown Foundation, the RMC ’65 Class, and is a member of the Quart Club. He is the originator of the SHINPADS concept of ship combat system integration and the authour of numerous papers on combat system design, interactive television and data broadcast.